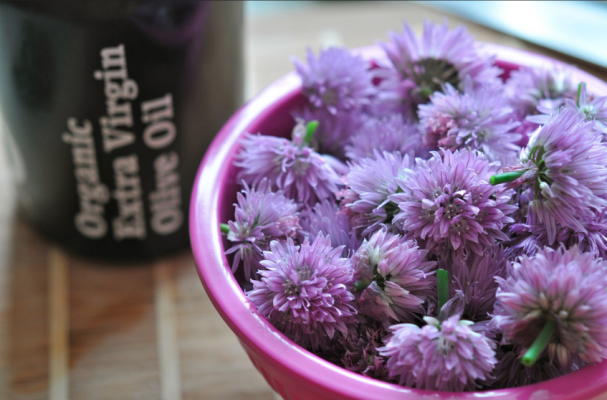 Homemade chive oil is the perfect way to utilize your summer herb garden. This simple homemade oil can be used a number of different ways in the kitchen. It can be the base of an herbaceous vinaigrette, a finishing touch to poached fish, or mixed in with scrambled eggs for a mild onion flavor. The technique outlined in the recipe can be used to make any leafy herb oil (think basil, mint, or oregano). it is important to note that you want your ingredients to dry as much as possible before combining them with the oil to prevent bacteria growth. If you are not in a hurry, I suggest leaving the ingredient out overnight to dry. Also, feel free to make your chive oil more complexly flavored by including other ingredients such as peppercorns, chiles and lemon rind. Step 1: Fill a medium saucepan with water and heat over medium high heat. Once the water is boiling, blanch the chives for 10 to 20 seconds. Remove immediately and place in ice water. Step 2: Place the chives between two paper towels and dry them thoroughly. Step 3: In a blender, puree the chives with olive oil and a pinch of salt. Pour the chive oil into a bottle and store in the fridge. *Note: This oil will last for a week.